Eli had actually left Ohio in 1852 to head for California, returning in 1855, then leaving again in 1858 for Douglas County, Illinois, then Jackson County (for more detail, see his page). So Annetta was used to running the family and the farm on her own. 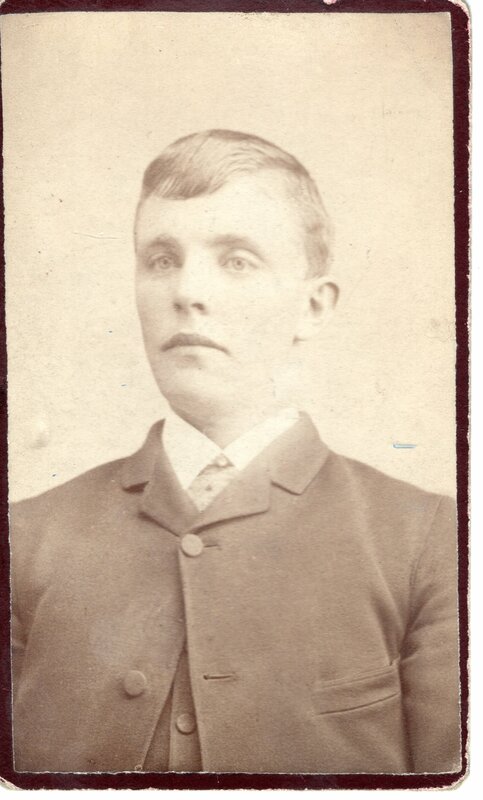 Of her sons, at least William Helmus (“W.H.”) was already in Wyoming Territory by the time she moved there; Jethro (“J.T.”) may have been there as well. 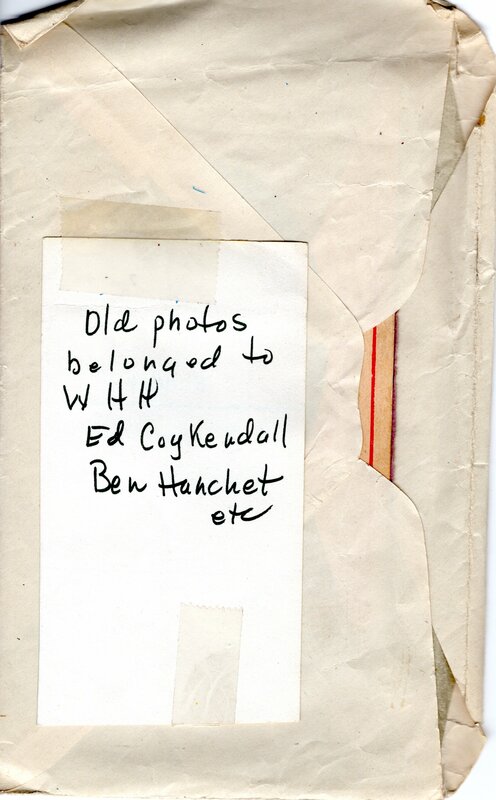 Photos from an envelope labeled with Annetta’s name are below, along with a copy of what is written on the envelope. 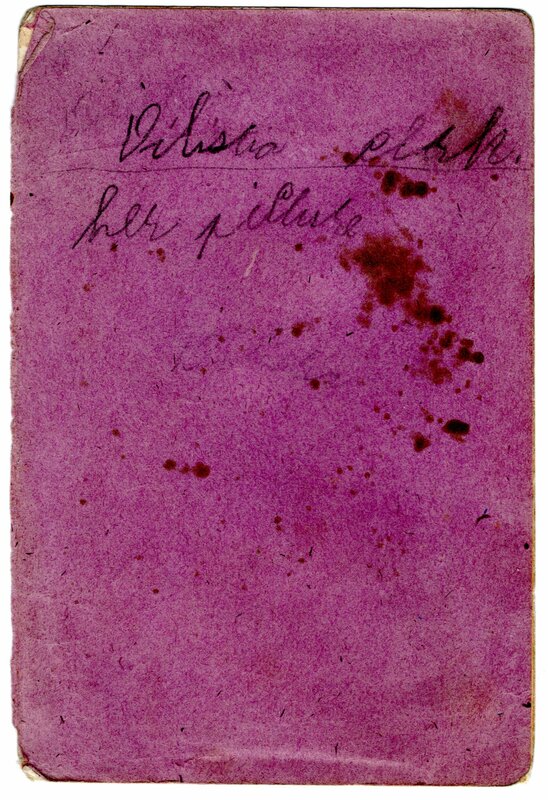 Although the envelope indicates that a photo of Annetta should be inside, none of the photos seem to be of her. 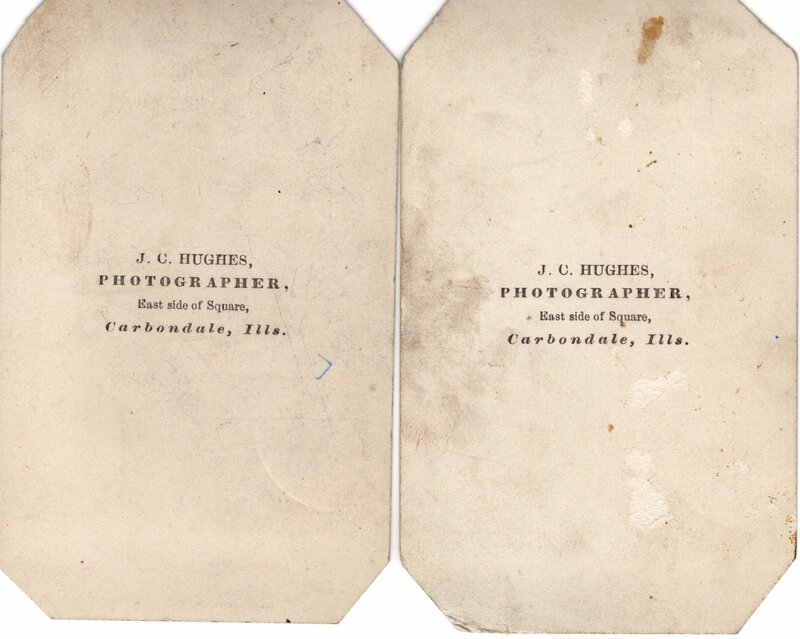 The backs of these “cartes de visite,” a smaller precursor to the “cabinet cards” of he 1870s and 1880s, indicate that they were taken in Carbondale, Illinois, which is in Jackson County. Eli evidently headed for Illinois in 1858 (see narrative above), but he first settled in Douglas County, then moved to Jackson County. 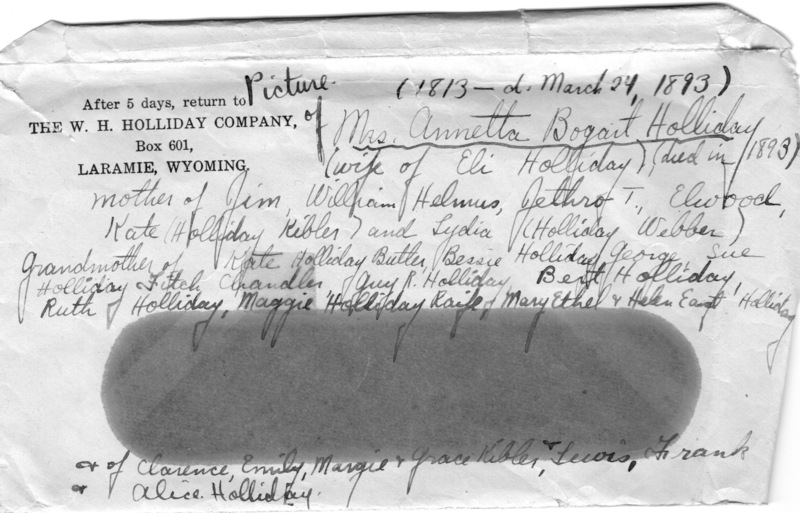 Annetta, after Eli died, is said to have moved the family to Wyoming in 1870. 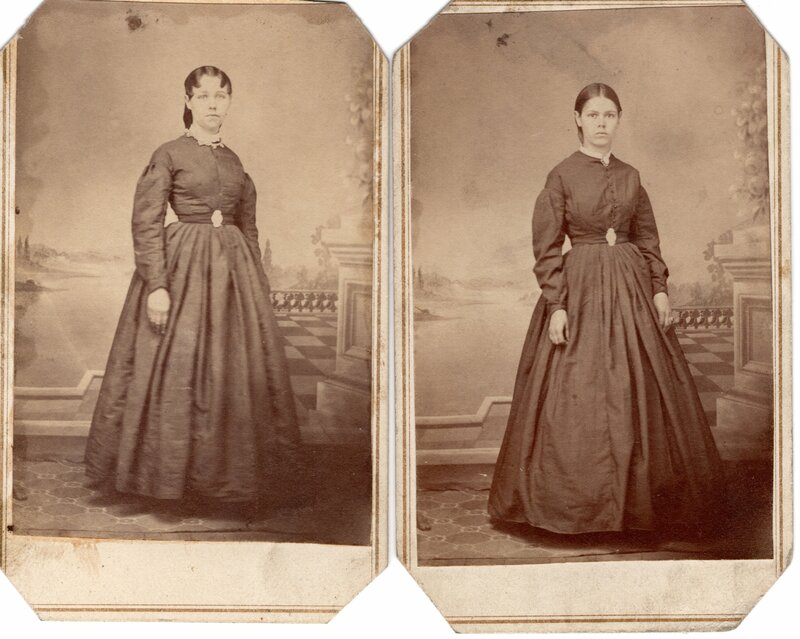 Judging from the apparent age of the girls in the photos, if they are Kate and Lida, it would seem that these pictures were taken closer to 1870 than to 1858. 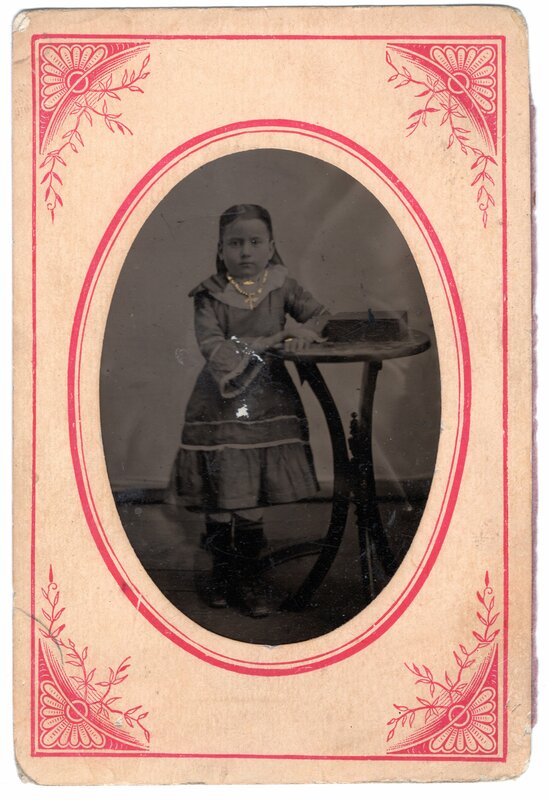 The approximate size of each mounted photo is 2.5" by 4". None of the Holliday or Bogart connections really connect to Edina. Any guess is possible. 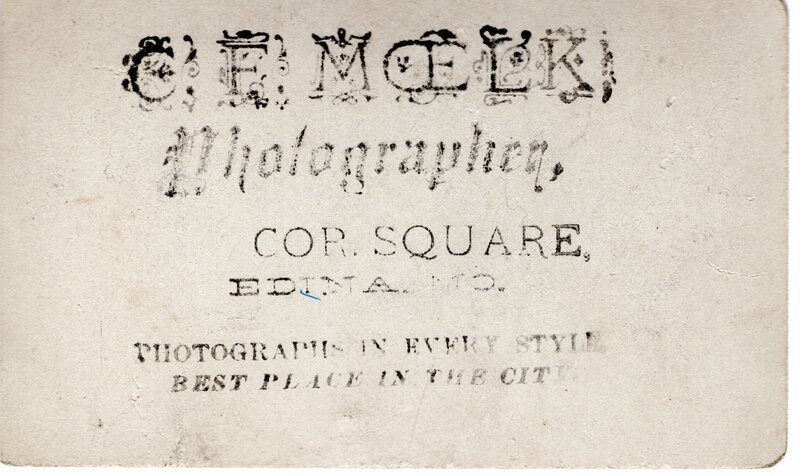 The photo size again is approximately 2.5" x 4". 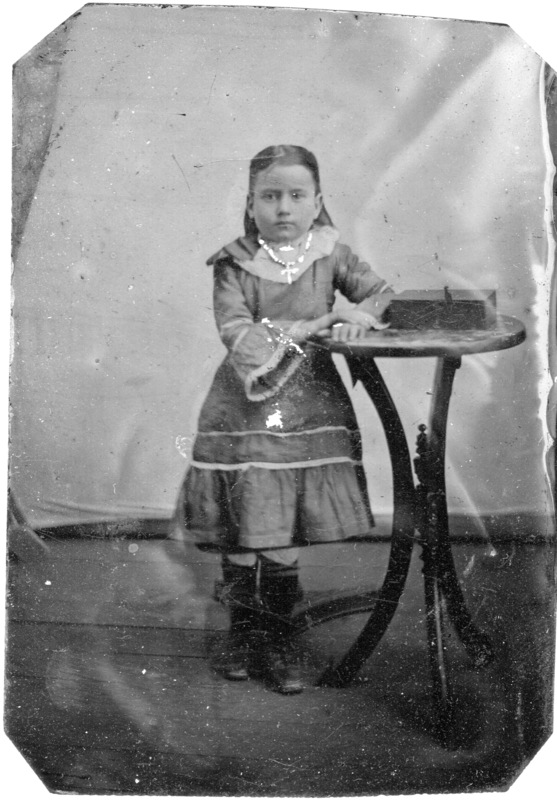 The label on the back of the paper frame holding the photo (which has been visbly retouched, to add a cross on a necklace and possibly some decoration on the dress), identifies it as “Dilistia Clark,” not a name I can connect to this family. The closest I come is to say that Annetta has a son named Elwood Clark Holliday, so the Clark name must come from somewhere. From the Holliday side? (What was Eli’s mother’s family name?) The Bogart side? And who is Dilistia? The Bogart Family: Tunis Gysbert Bogaert and His Descendants. compiled by John Albert Bogart, entered Library of Congress 1959, privately printed by Haddon Craftsmen Inc., Scranton, Pennsylvania. Also see notes [link removedask Webmaster] typed by Helen East Holliday DeWitt.